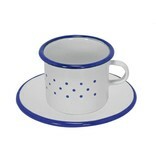 Enamel cup and saucer with blue paint. 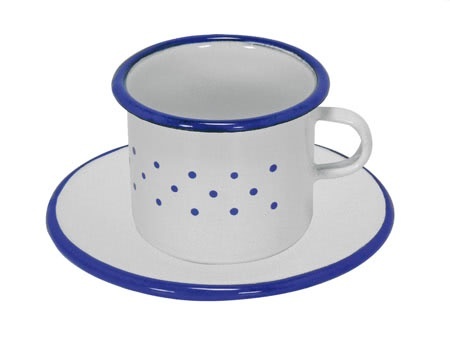 Dimensions: approximate diameter of saucer 9 cm and height of cup 6 cm. Theres always something to do at home. The kitchen is the place for baking, cooking, eating, drinking, and cleaning up. What could be more fun then to do exactly what mommy is doing while using all your own cooking and baking utensils from the Gluckskafer childrens housekeeping sets.